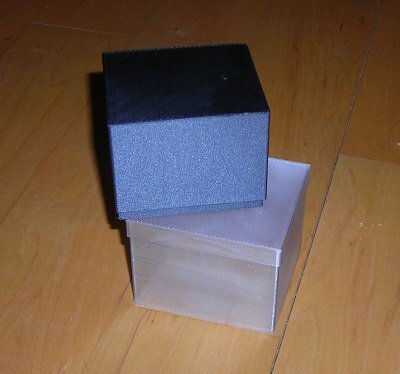 Lubor Fiedler's Gozinta Boxes is my all time favorite illusion. It has been so ever since I first saw it performed decades ago. I love the simplicity, clarity, and impossibility of the effect. Two boxes. One clearly larger than the other, because one fits into the other. But wait - now the larger one is smaller and the smaller one is larger. Every child can understand the impossibility of this. It transcends any language or cultural barrier. Since no explanation is necessary the magic first happens on a very deep visceral level. But then when the mind kicks in and tries to find an explanation for it none can be found and the illusion is deepened. Over the years I have been making my own versions of Lubor Fiedler's Gozinta boxes. I even made a three box version the Triple Gozinta Boxes. The version I am offering here is a two box version but with two distinct improvements over Fiedler's original. One box is transparent. This creates a more visually stunning climax. You start out with the transparent box inside and end with the transparent box, which has the shallow lid, on the outside. The final display is one of total impossibility, because the box can be seen inside. In summer of 2012 I visited Lubor Fiedler in Brno for a full day. It is one of those days I will never forget, because it was magic from morning until evening. We exchanged a lot of creative ideas and we had a lot of fun. During that visit I was able to demonstrate Lubor my Gozinta Box variations. The one I am offering here was one he really loved and he gave me permission to market them. I told Lubor that my goal was to have them 3D printed. But back then my 3D printer was not capable of doing it, and sending them out to print services was too expensive. Now I do have a printer that is capable of printing them. I am aware that the price I am asking for this version of the Gozinta Boxes is quite steep. But keep in mind that 3D printing is still an expensive undertaking. Every second box I print goes into the trash because it didn't turn out the way I want it to be. Creating these boxes is still more art than science. I also do not plan to make many of these. Even though I am not calling it a limited edition, the very nature of how they are made will make them so. And this version, which Lubor Fiedler loved, is in my humble opinion quite a bit stronger than the original. You will only receive the two boxes. There will be no explanation, patter or directions supplied, because none are needed. As long as you can open and close a box you can do it. One of the best ways to perform it is silently. Let the magic speak for itself. But it is equally straight forward to find a patter suitable for you.